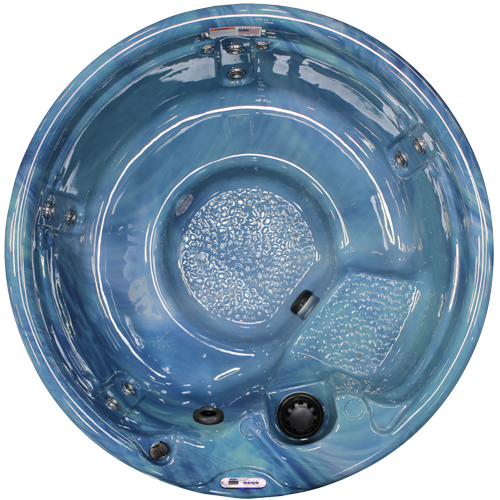 Inground™ Spas are the ultimate answer to relaxing in-ground hydrotherapy. Dimensions: 84" X 84" X 40 1/2"
Feel your life change for the better as the jets massage you from your toes to your upper neck. 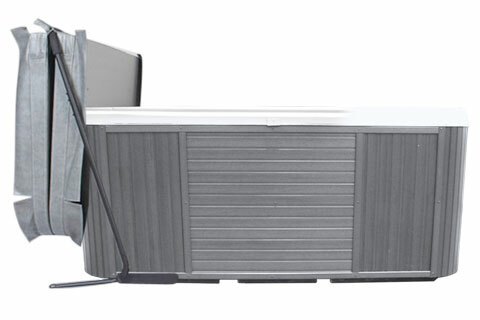 Enjoy real value in your outdoor living space with 51 exclusive VelocityTM Jets. This spa will entertain guests along with giving you the most out of your hydrotherapy session. Durability is paramount with it comes to your home investments. 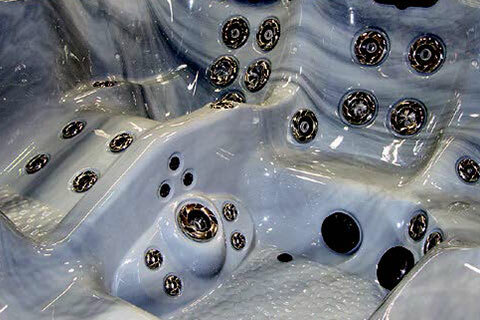 Thats why Cal Spas hot tubs utilize the exclusive Fibersteel Construction Process. The finest acrylic sheets are vacuum molded into shape, then reinforced with vinyl ester and fiberglass. After curing, the shell receives a resin filler coat, fiberglass and calcium carbonate. Stiffener reinforcement supports and 1.5 inch angled irons are added to ensure maximum strength. A final filler coat is applied to seal, bond and toughen the overall structure. 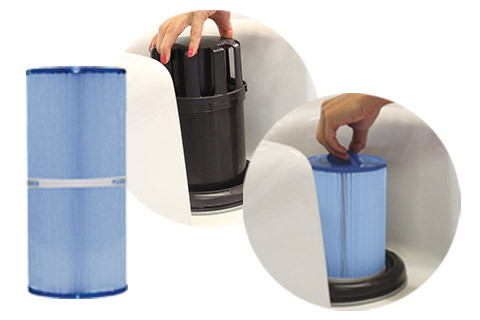 Our Eco-friendly Bio-Clean Antimicrobial Filter utilizes a special bacteria-fighting agent that is molded into the fabric. This unique protectant prevents harmful microbes and bacteria from reproducing and re-entering your water system ultimately minimizing the need of chemical sanitizers during regular cleaning and maintenance. 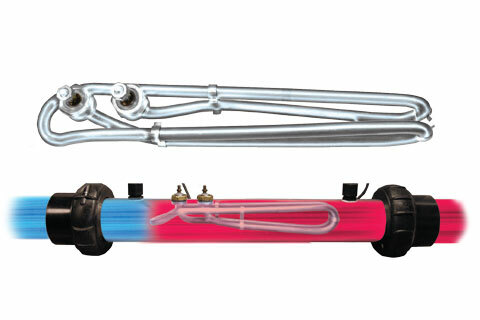 Titaniums inert properties resist corrosion and calcium build up, making it the most advanced and reliable heater in the industry. Insulation Cal Spas Thermo-Shield insulation system starts by installing a unique material primarily comprised of post consumer recycled denim. This 3 thick insulating material foundation is then thermally bonded with a 99% pure aluminium reinforced foil sheet on one side creating a radiant heat shield which directs motor and equipment heat back into the spa, retaining residual heat and increasing energy efficiency. Next, we install a layer of dual walled reflective bubble foil to the floor area of the spa to reflect heat upward into the spa seat and floor. Finally we add an ABS liner or ABS moulded pan that locks in heat and keep moisture out. 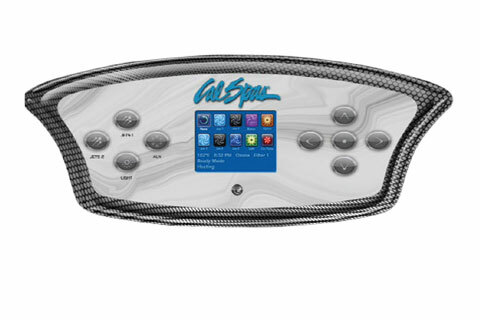 An intuitive electronic spa control system designed to easily adjust the settings of the spa to meet your therapeutic needs. Dimensions (W x L x H) 84" x 84" x 40 1/2"
Spa Cover: Gray or Slate 4" to 2.5"
Durability is paramount with it comes to your home investments. 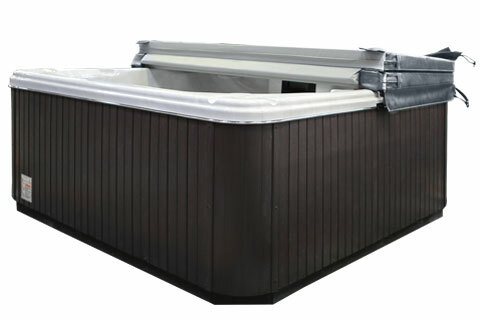 That’s why Cal Spas hot tubs utilize the exclusive Fibersteel™ Construction Process. The finest acrylic sheets are vacuum molded into shape, then reinforced with vinyl ester and fiberglass. After curing, the shell receives a resin filler coat, fiberglass and calcium carbonate. Stiffener reinforcement supports and 1.5 inch angled irons are added to ensure maximum strength. A final filler coat is applied to seal, bond and toughen the overall structure. Our Eco-friendly Bio-Clean™ Antimicrobial Filter utilizes a special bacteria-fighting agent that is molded into the fabric. This unique protectant prevents harmful microbes and bacteria from reproducing and re-entering your water system ultimately minimizing the need of chemical sanitizers during regular cleaning and maintenance. Titanium’s inert properties resist corrosion and calcium build up, making it the most advanced and reliable heater in the industry. Insulation Cal Spas Thermo-Shield™ insulation system starts by installing a unique material primarily comprised of post consumer recycled denim. 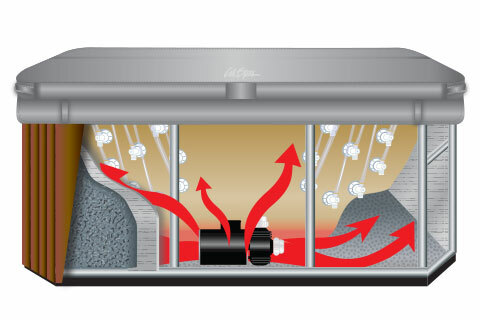 This 3” thick insulating material foundation is then thermally bonded with a 99% pure aluminium reinforced foil sheet on one side creating a radiant heat shield which directs motor and equipment heat back into the spa, retaining residual heat and increasing energy efficiency. Next, we install a layer of dual walled reflective bubble foil to the floor area of the spa to reflect heat upward into the spa seat and floor. Finally we add an ABS liner or ABS moulded pan that locks in heat and keep moisture out. Copyright © 2019. Cal Spas All Rights Reserved.